GM EOS Oil Suppliment 1950s - $10.00 : Bob Hoyts Classic Inspection Stickers, Add a Final Touch to your Restoration! 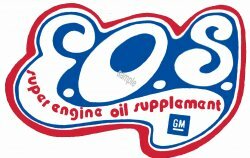 This General Motors EOS Engine oil suppliment sticker issued in the 1960's. It is appoximately 3 inches long by 2" high.